Last week State Senator Ray Scott embarrassed Mesa County residents and made a fool of himself by actually saying out loud on the Senate floor that climate change has led to “massive improvements” in our climate. Now Scott is co-sponsoring a bill, SB 19-250 (pdf), that will deal a blow to low income people served by Black Hills Energy, the gas and electricity provider for residents of Pueblo, Canyon City, Ordway and Westcliffe. Scott’s bill would do away with a two-tiered rate structure Black Hills Energy put in place in 2017 to help low income energy consumers by giving them more protection from a state-approved rate increase that happened that same year. Right now, Black Hills Energy charges consumers a lower rate for the first 500 kilowatts of energy they use per month. Customers who use more than that pay a higher rate for every kilowatt above 500 that they use. Scott’s bill would collapse that tiered rate structure into a single, per-kilowatt rate, a change that would discourage energy conservation and benefit higher-energy users. The Colorado Public Utilities Commission confirmed that the change means low-end users would have to pay more, while high-end users would pay less. 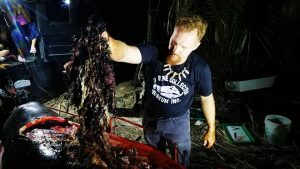 Scott is known for being a simple-minded climate change denier who takes money from the oil and gas industry and has been unable to grasp the science behind climate change. Scott completed high school but has no college education. He uses Shutterstock photos to portray the “hard working Mesa County families” in his blog posts, rather than photos of actual hard-working Mesa County families, of which there are many. Last June Ray Scott was caught double-billing his expenses to both his state expense account and his re-election campaign account. WCAF is the area’s longest-serving secular group, and their billboard is to help encourage people come to logical conclusions based on verifiable facts rather than basing conclusions on dogma, fables, mythology, superstition or sheer faith. 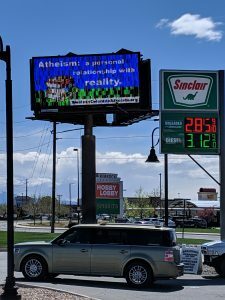 That’s the message of the group’s spring, 2019 billboard, which went up today on I-70B by Rimrock Marketplace in front of Hobby Lobby and Chick-Fil-A. The board is west-facing and visible to traffic coming into town. It will be up for one week. Take photos with it while you can. 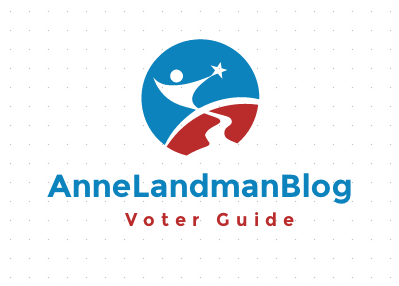 Following are AnneLandmanBlog’s recommendations for how to vote in the 2019 City of Grand Junction April 2, 2019 Regular Municipal Election. 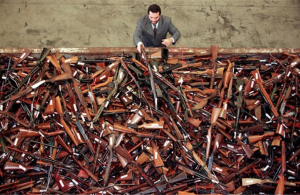 The new laws banned all fully automatic, semi-automatic, pump-action and self-loading firearms, prohibited private sales, thus limiting who could legally sell or supply weapons, enacted minimum requirements for licensing of firearms and put in place more secure storage rules for firearms. The new laws also created a mandatory ‘cooling-off’ period of 28 days before a person could granted a gun license, introduced compulsory safety courses and required people applying to purchase firearms to supply a “genuine reason” that they needed to own a firearm, and that reason could not include self-defense.